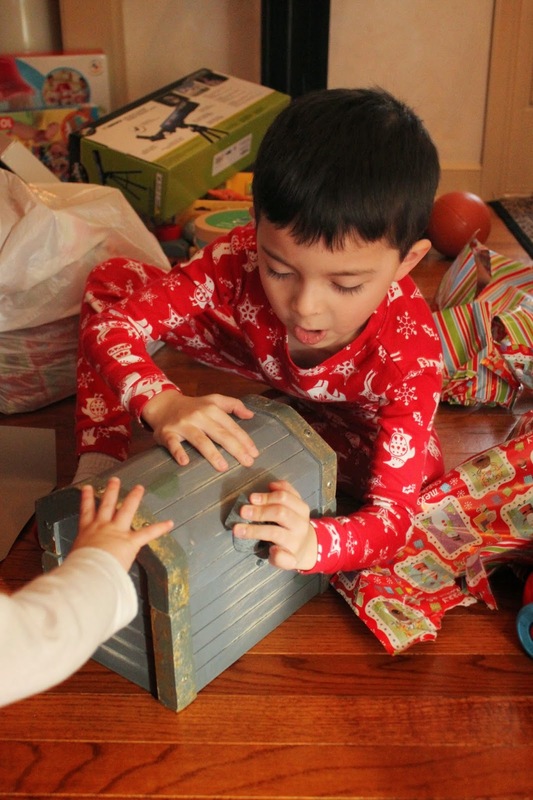 Christmas morning was so much fun this year! Brian woke up first, around 7:30 - and we all waited in our room until Hope woke up around 8! Brian was so patient and just sat in our bed watching a TV show until it was "show time!" I snuck downstairs to turn on the lights and some music and had my camera ready to record him coming down the stairs. I can't wait to film Brian AND Hope walking down the stairs next year! Brian wanted to open the stockings first. Instantly he reminded us, as usual, that it's all about the little things. You would have thought this Lifesaver Storybook (just like I used to get as a kid every year!) was a gold brick! But the real reason for his excitement? That Storybook was in Gavin's stocking. Santa specifically said in his "thank you for the store bought rice krispie treats" note that he would always put a gift or two for Brian and Hope in Gavin's stocking as a reminder to them that Gavin would want them to be happy and enjoy themselves. Brian was really impressed, too, that I was able to capture Santa IN OUR HOUSE! I set up my camera on a tripod near the tree each year. Then I turn on my special "Christmas setting" that will take a picture if it thinks it spots Santa putting presents under the tree. AND IT DID!!! We got to opening presents and it was interesting and heartwarming to watch. Hope was super confused by all the "stuff" for a while and really only wanted to watch and be near Brian as he opened his presents! Brian was a riot. He was so excited about every little thing - and after he opened each present he would stop - hold it up - and pose in case I wanted a photo. This was unprompted!! (I swear!) I suppose he's been trained well. Ha!! I'm not sure who is more excited about some of these toys - Brian or ME! 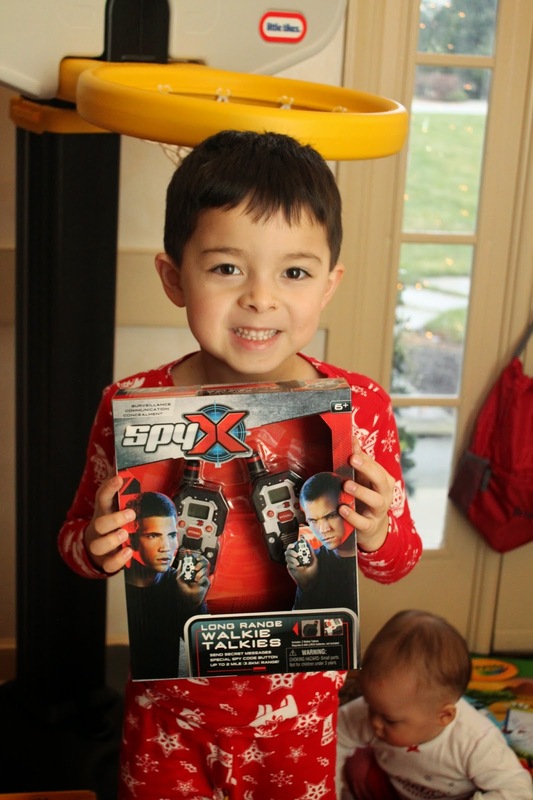 I can't wait to play with these walkie-talkies with him. They have a 2 mile range! Soon Hope got more curious and started to explore her presents - the majority of which were unwrapped so they would capture (and hold) her interest immediately. I've always been in love with the "Laugh and Learn" line by Fisher Price. Many of Gavin's favorite toys were "Laugh and Learn" so hearing the familiar voice and songs in the house makes me very happy. This is a medical kit! Doesn't look even remotely like the one I had growing up. And it certainly didn't sing! Well, unless my Dad was playing with it with me - he had a song for everything. Growing up felt like living in a musical! 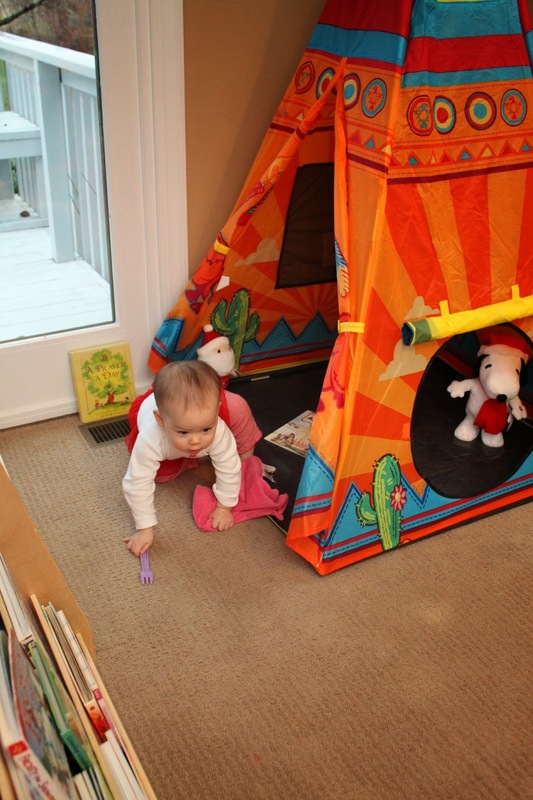 I think my personal favorite gift this Christmas was the huge Tee Pee for our reading nook. It's nearly six feet tall! Brian, Hope and I have already snuggled up in there to read books and we all fit comfortably with a blanket! And Santa left a book that taught Brian a lot about Native Americans and how they were the first Americans. He was fascinated. I see this play tent getting a lot of use. Ed was most excited about the Rody Horse. He played with Hope on a horse just like this during Brian's birthday party at Bounce U - and she laughed and laughed as he bounced her on it. 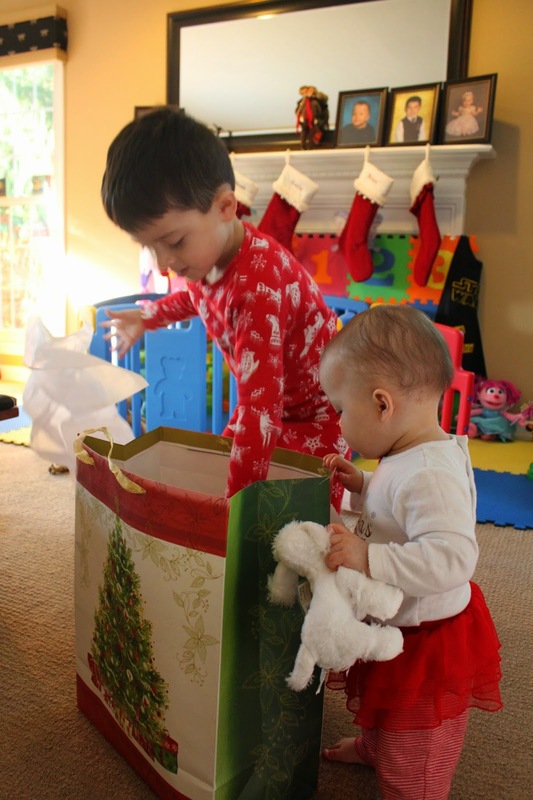 He couldn't wait to see her reaction on Christmas morning...and she didn't disappoint! This might just be her favorite new toy! She walks up to it and starts bouncing in place - it's hysterical! 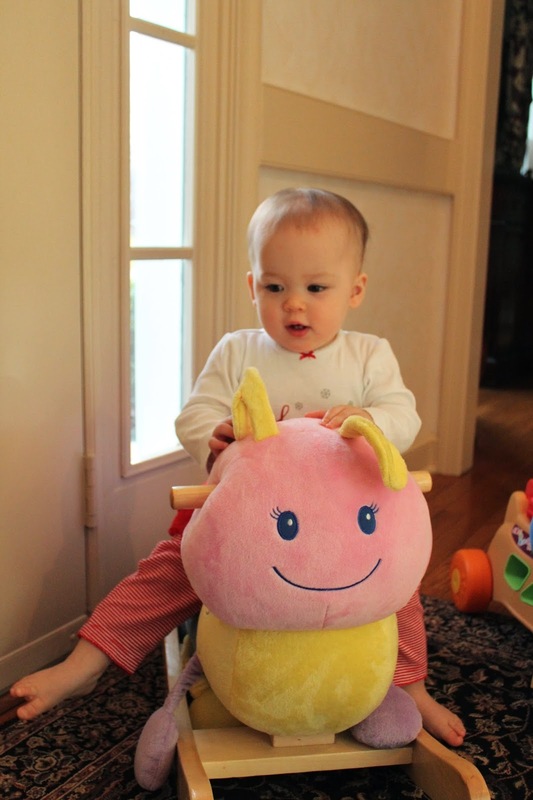 She also loved her caterpillar rocking horse! This girl loves to move, move and keep moving. ...and a "Batbot!" He has really taken an interest in Batman this year. I loved watching Hope investigate her new princess mirror. Especially when she saw her cute face in the mirror! I think my favorite part of the day was when we all exchanged our gifts with each other. Brian had gone shopping at school in a special "Santa shop" they had one day. He spent time choosing special gifts for each of us. A friend that was volunteering that day told me he was on a mission to get something very special for Hope. It was a little stuffed poodle and, as you can see, she loved it! Brian got notepads and pens, post it notes and markers and glitter glue - all things he loves. He also got a shirt that says "Awesome Big Brother!" and a glow in the dark Lego shirt. He was thrilled with everything and has been carrying around one of the notepads and pens all day "in case I have to jot something down, Mom." He picked out an ornament for me that says "Best Mom Ever" and a super ball for Ed, which is something that they love to collect when they go to a local arcade. It was all so sweet!! Ed surprised me with an upgraded camera. I'm not sure it's possible, but this might mean that you'll see even MORE photos from me in 2015. You've been warned. Brian helped Ed open the gifts from me and the kids. Framed photos of Brian and Hope for his office, which he loved! And a "racing experience" at a real racetrack in the Poconos where he and two of his closest friends that were in our wedding can drive real race cars! He won't have to worry about car seats in the back or his wife saying "slow down" or really anything at all. He deserves a weekend away with his friends! It was fun to coordinate this with the other two wives - it felt like we were arranging a play date for our boys. Ha! We literally stayed in our pajamas all day - even through a fancy (and delicious) ham dinner in the dining room! It was a relaxing, special day with nowhere to be but with each other. 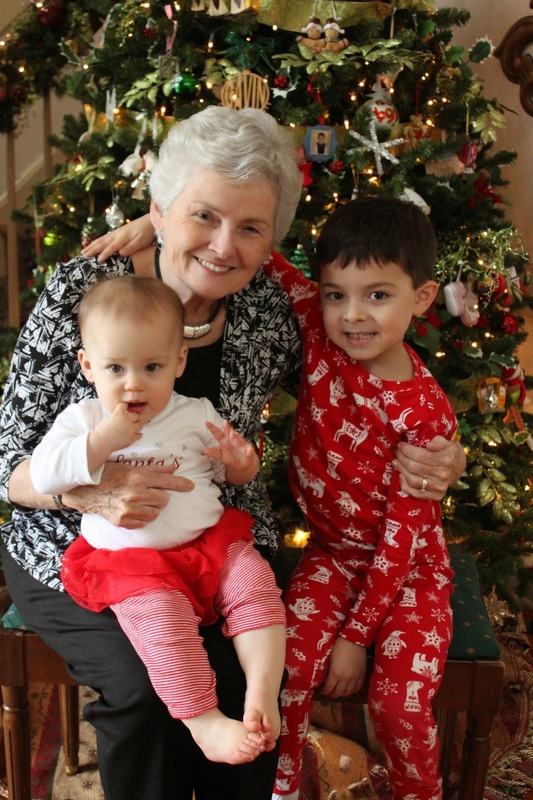 A highlight of our day was when Granny came by to visit and to see all the gifts that Santa brought! She was with us overnight last year, which was so special. This year she split the time between my sister, Bean, and my brother, Tom. She's a wanted lady!! Brian was so happy to see her (as usual) and even had a "Best Grandmom Ever" ornament for her! It was a wonderful Christmas, despite missing Gavin so much this year. Each year, I intend to include Gavin in our Christmas card. Sometimes it's subtle - like the photos of all of us by "Gavin's pier" in Ocean City, NJ. This is the pier that has been in the backdrop of many beach vacation photos and memories with him. He loved this beach and the ocean - and pretty much everything about Ocean City. So much so that Ed and I scattered some of his ashes off of this pier. Sounds like you had a wonderful Christmas! Kate-it seems as if you all had a wonderful Christmas! I smile and smile as I read your post all the time! Happy New Year to you and your family. God bless. Great photos. Looks like you had a lovely time. I am happy to say, you can never post to many pictures. I cannot wait to see picture next year. Merry Christmas!!! Thank you so much for your posts. It looks like you a an amazing Christmas. The pictures are very good and I'm happy for you that you got a new camera. Brian and hope are so cute. It is great that you "caught" a picture of Santa leaving the presents. I love the idea of the gifts for Brian and Hope in Gavin's stocking. What a great way to include him in your holiday. I just realized while reading that it hasn't been that long since you lost Gavin. I know he is always with you in spirit. I am sorry for your loss and know that God comforts all of you through your other two blessings. Brian and Hope are little angels sent from Heaven to you. They are both so special. God bless you all and Merry Christmas. May you have a joyous New Year. Love you you all. Love this post! I know I have said this before but Brian resembles your Mom so much! She is one gorgeous lady! Merry Christmas!